Meralag is a sleepy town of untroubled Indoril nobles and their retainers, nestled in a pleasant vale in the Alt Orethan region. As some of the locals might put it, it is "A fine example of the refined Indoril way of life". 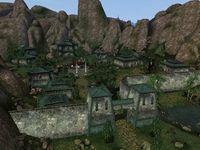 The town is a common rest stop for pilgrims travelling south on the way to Almalexia, or those on their way from the capital city north towards the Telvannis District, Vvardenfell or Old Ebonheart (via Ildrim). Juvol Andres rents rooms, and sells food and drink at The Golden Glade. Athryil is staying at The Golden Glade and would like some help with tracking down a recent shipment. A small market plaza in the center of town has merchant services, consisting of Merandil the Alchemist, Deren Llethros the Clothier and Dravayn Eluvel the Trader. Gondoril is a newcomer to the community and requires assistance with carrying out a good deed. There are no fast-travel services except for intervention. Boat travel can be found nearby at Darnim, and the cave network known as Mansurabi offers a quicker, although not exactly safe shortcut there under the mountains. Mansurabi is a series of smuggler tunnels, an entrance to which can be found west of the town, behind a large waterfall. 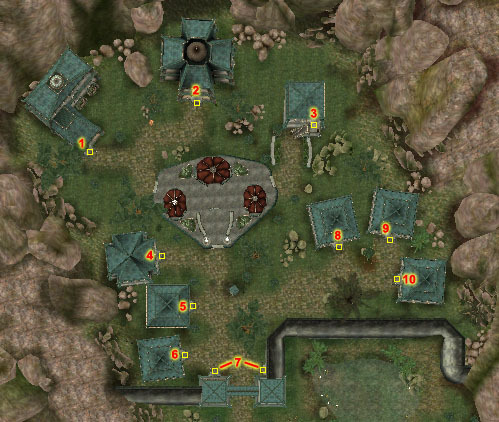 Zanammu is a large, strangely-designed (and undead-infested) ruin that can be found just northeast of Meralag. Lost and Found: Return an amulet on behalf of a Bosmer. Tunneling to the Truth: Investigate a smuggling ring near the sleepy town of Meralag. This page was last modified on 6 March 2019, at 08:07.